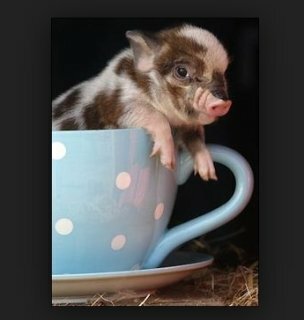 The only difference between a small pig and a tinier pig is the name, and perhaps to fracture the famous quote made by our favorite Elizabethan Bard: “a pig by any other name would smell the the same.” Small pigs have been described as "teacup, toy, pocket, micro, mini, nano and Juliana." And while each name might infer something slightly different, the fact is that the smaller the swine, the more popular they become. What seems to be happening out there in the pig reproductive business is that different breeders like to differentiate their petite piggies with fanciful names to gain a competitive edge in the marketplace. To date there is no one animal organization or association that definitively defines the differences between these descriptive terms. Modern-day, 3 Little PigsMini pigs were first documented by the bio-medical research industry in the 1940s. According to ‘The Mini Pig in Biomedical Research,’ scientists started using smaller pigs more frequently for research purposes where their size made them easier to handle. So many of the miniature pig breeds ended up being created by crossing many different types of pigs and then breeding them down in size. Sizing them down, yet still. . . 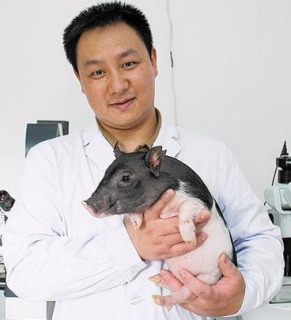 Going one step further, BGI, a genomics institute located in Shenzhen China, announced recently that it is genetically engineering miniature pigs to sell as pets for $1,600 each. Their gene-editing techniques takes the genome of a Bama - an already small breed of pig — to make it even smaller. It accomplishes this by using the enzyme TALENS to disable one of two copies of the growth hormone receptor genes in the pig’s fetal cells. Dissimilar to to full-size Bamas which can weigh up to 100 pound — these lab-created pigs will top off at a maximum of 33 pounds when they reach maturity. According to Yong Li, technical director of BGI's animal-science research group, the scientists have not observed any health problems associated with cloning in any of their gene-edited experiments to date. Miley Cryus & Paris Hilton with Pocket-Pigs!In the future, the institute promises to offer miniature pigs in a variety of coats, colors and patterns, which will be achieved through further gene editing. Miley Cyrus' Bubba Sue and Paris Hilton's Princess Pigelette are proud owners of the two micro-pigs. But, swine-loving celebrities will have to wait for further innovations for truly purse-portable pigs. And as you can see in this YouTube video with almost 4 million views there’s a lot of interest out there for regular folks like us to also purchase these little piglets. Can This Kitten Be More Cute? The Animal Video of the Day!!! The Correct Way To Carry Groceries -- The Animal Video Of The Day!!! Ultimate High Five! The Best Pet You Could Ever Have Animal Video of the Day!! !